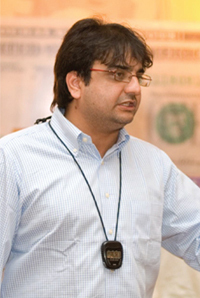 Farhad Karamally is an Organisation Development (OD) consultant, management facilitator, published author, a habitual entrepreneur in short a catalyst for change. Farhad specialises in unleashing human genius through leadership, creativity & change management initiatives that assist in architecting excellence in organisational culture. Over the past 18 years Farhad has developed many branded training products which can be customised to meet specific requirements of organisations across the private & social sectors of different countries & cultures. He has designed & customised value adding interventions for organisations like Acumen Fund, UNDP Pakistan, GIZ, UNICEF Education Programme, Pakistan Poverty Alleviation Fund (PPAF), World Food Programme (WFP), Engro, Reckitt Benckiser Pakistan & Sri Lanka, Bayer CropScience & Health, Novo Nordisk, Eli Lilly Pakistan & Thailand, Novartis Consumer Healthcare Pakistan & Middle East Cluster, Procter & Gamble Pakistan & Kazakhstan, Unilever, NestlÃ©, Coca-Cola, Pepsi Cola International, Shell Pakistan, Barclays Bank, Dubai Quality Group, Al-Batha (Dubai), Holcim Cement (Sri Lanka), COGEF Group (Mozambique), Samba Financial Group [formerly known as The Saudi American Bank] (Saudi Arabia), British American Tobacco, OMV, Schneider-Electric, DHL, Merck, Maersk, Standard Chartered Bank, Oracle (South Asia Growth Economies SAGE), Linde Group, 3M & numerous others. As a practitioner of appreciative inquiry to get results, he is renowned for facilitating strategic meetings with management & leadership teams to envision future strategies. Since 2010 he has been working on the concept of Compassion in Business and also published a survey report measuring compassion in businesses. Farhad has been named as a Fellow of the International Center for Compassionate Organizations located at the University of Louisville. His style and attitude to life can best be explained through a comment made by Ed Scannel (author of 15 books incl. Games Trainers Play) after experiencing Farhads session at the Asia HRD Congress Indonesia: Learning is Fun & You Proved It! As an entrepreneur, Farhad is CEO Funverks Global, Co-Founder/Director Navitus (Pakistan), Founder & CEO Navitus (Sri Lanka), Director Stimulus, Tangerine Media, FK Squared, The Bottom Line Holidays (Sri Lanka) & Partner Seed Incubation Centre.